The earth fell away behind me. In the rear-view mirror, I caught a glint of the Avon’s meanders. The road that climbs towards Upton Cheyney sits on an outcrop of the Lansdown Hills, a few miles west of Bath. It is submerged under over-arching boughs of trees that lean from high banked hedgerows. Ascending through the greenness amplified the feeling that I was leaving the everyday behind, entering a realm on an entirely separate plane to that of the nearby city. I passed a pub, then an old red telephone box with a rambling rose beside. An inviting courtyard of an ancient farm passed by with its sign for a farm shop, then the road forked right and steepened. To my left, through the occasional gateway, I glimpsed a huge vista that lead the eye across both Severn bridges towards Wales, Bristol merely a smudge in the middle-distance. The view to the right fell away into a valley and towards North Stoke, a picturesque hamlet of stout parish church and period buildings. I parked in a small turning and got out. Until now, I hadn’t realised the strength of the wind. The whole hill was in turmoil; the fields of young wheat were harried and flattened by a thousand zephyrs while ranks of nettles stood motionless, harboured by the field’s margin hedges. The purpose of my journey, a small wood, seethed anxiously behind me, its very architecture in flux. This threshing noise that poured through the porous edges electrified the air; that I was here as a thief, made the sense of anticipation even stronger. I took the old Sandvik saw, still in its yellow and orange cardboard sleeve, opened the gate, and entered. The path was wet and pocked with deep, muddy footfall. I had to skip from edge to edge and pivot under branches to avoid slipping. I ducked under a natural archway of elder and penetrated the interior of the wood. Inside, it was calmer. The wind still fretted the crowns of the trees, making the sun dapple through the shifting canopy, but at trunk-level, it seemed as though I were in the eye of a storm. Windfall covered the ground: long, sinewy arms of ash, thousands of pieces of oak and hazel shrapnel. These were the dominant trees of the wood. 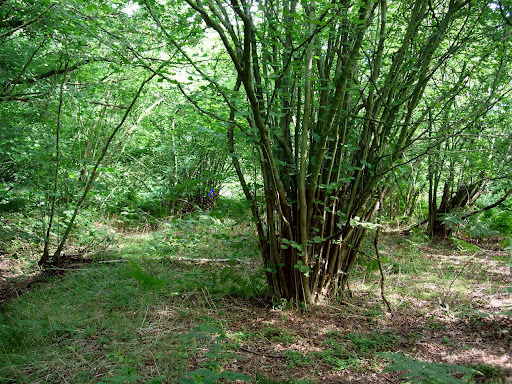 All about me were stands of neglected hazel coppice, their pale branches shining through the shifting gloom. Many rose over twenty feet, their inverted triangles grown like wiccan altars. That they had been forgotten was clear; in years past, their straight, pliant branches would have been harvested every six or seven years. This would have maintained a uniform crop of the right width for use in fencing, hedging, thatching, even river flow management. Such quaint materials are now much less valued and coppice woods are not often viewed as commercially viable. The hazels here had grown literally out of hand, their shapes and diameters no longer the right cut that the old coppicers would have desired. I could see many that would fit my purpose, however. I wanted twenty or so thin, straight poles that I could make a gypsy bender with. A bender is a simple round-framed tent covered in canvas or tarpaulin that was favoured by travellers for its ease of construction and the ready availability of whippy hazel, ash or even willow branches with which to make one. I cut my poles near the base (or stool) and at an angle to reduce the chance of damp/infection getting into the plant. The sawing rasped at a lower frequency to the wind and pierced the wood, alerting anyone that might be about to my business. I could hear nothing other than the wind and the saw, and so cast my eye about continually in case the owner of the wood chanced to wander nearby. As I worked, the dark, bloated oaks and more graceful ashes imposed their presence into my peripheral vision. These were the standards, the larger, slower, overstorey trees originally planted alongside the coppice hazel to provide a more valuable, but less regular source of wood. Where the hazel would have been cut every seven years or so, these guardians of the wood were kept a hundred years before felling; they were the long-term investment of the woodlander. These specimens had been spared the executioner’s axe, but neglect meant that they now cast far too much shadow over the lower trees, causing them to twist and contort, which made the task of selecting suitable poles difficult. In less than an hour, though, I had a good crop which I dragged to the edge of the wood for a covert and hopefully quick loading of the car. I left the wood reluctantly. It had invigorated me and given me sanctuary, inspiration and purpose. Not one other person had disturbed me, despite being within a few miles of two cities with half a million people between them. The wind blew and the trees remained insentient, but I took more than just sticks.